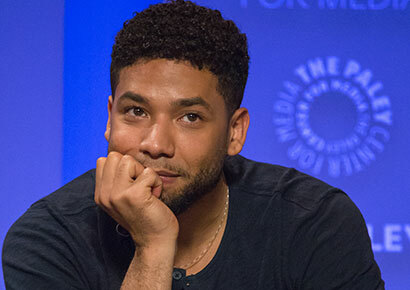 Actor Jussie Smollett has revealed that he fought the two men who attacked him in a terrifying homophobic and racist hate crime. In a video posted online, he also spoke to the supportive crowd about the attack to clarify what actually happened. “I was bruised but my ribs were not cracked, they were not broken. I went to the doctor immediately, my friend Fred Jackson drove me, but I was not hospitalised,” Smollett said. It was the first time Smollett, 36, had been seen in public since he was attacked in Chicago last week Tuesday. In the early hours of the morning, he was accosted by two men wearing ski masks who shouted homophobic and racist slurs at him. Smollett was beaten in the face and had an unknown substance, possibly bleach, thrown onto him. The men also put a rope around his neck before fleeing the scene. The Chicago Police Department, which is treating the incident as a “possible hate crime”, has released images of two individuals who are “people of interest” in the attack. The photos, however, are extremely unclear and depict two figures shrouded in darkness with no visible facial features.